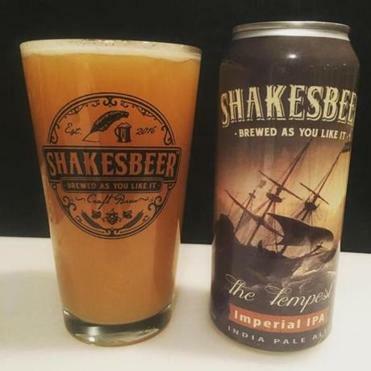 The Tempest is one of two brews currently offered by Shakesbeer. When you name your company Shakesbeer, you’re bound to be approached by theater-loving aesthetes dropping their favorite lines. The couple met at Colgate, where Jessie was an English major and Mike was “a guy who liked beer a lot.” She wrote an honors thesis on the women in William Shakespeare’s plays. Like many other folks who start their own breweries, he’s an avid homebrewer who has decided to strike out on his own. Shakesbeer currently makes two beers. A stronger IPA, The Tempest, is named after one of the British playwright’s well-known works. Shakesbeer doesn’t have a physical brewery. Sartor currently brews at Shebeen Brewing Co. in Wolcott, Conn. He’s moving a portion of that production to Ipswich in the coming months, and someday the couple would like to open up their own shop in Hingham. The company’s third beer, a hoppy pale ale brewed with lemon zest and aptly named A Midsummer Night’s Dream, will be released May 1.